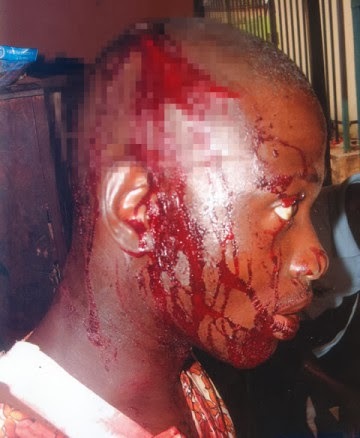 A newly hired employee of a Chinese firm based in the Sagamu area of Ogun State has accused his Chinese boss, Mike Jackson, of brutality. The victim, Adeleke Owolabi, told Punch Metro that Mike and his cousin, Tony Jackson, brutalised him during an argument in Mike’s office. Owolabi said he had just been hired by Mike to be a marketer in the northern part of the country. The 40-year-old victim said, “I have been self-employed for a long time and I met Mike sometime last year. He offered me a marketing job in his company and asked me to resume in the first week of January. “He produces PVC, a roofing material, and said he wanted to expand to the north and since I needed the job, I accepted. I went on January 6, but he told me to return the following day. However, I could not make it because I travelled. On January 8, I returned and after discussions, he said I should go get a sack in which I could put the PVC into. The graduate of Mass Communications from Olabisi Onabanjo University said when it was about 4pm, he told Mike that he wanted to leave so that he could arrive Kano on time, but an argument ensued. He said Mike became violent and descended on him. Owolabi said, “After pleading with Mike, he said I should remove the PVC from the bag and return the bag. As I was doing this, Mike kicked me in my private part. I asked him why he was being wicked to me since he was the one who offered me the job. The father of two said when he woke up, he was covered in blood. He said a lady took him to the Makun Police Division from where he was referred to Idera Hospital for treatment. He alleged that the Chinese men refused to visit him at the hospital and did not offer any apology. He said the police refused to press charges against the Chinese men. “The police said since Mike and Tony were foreigners, a lot of things would be involved. I then reported the matter to a human rights organisation and the case was taken to the Nigerian Immigration Service, Ogun State Command. Mike and his cousin came on January 17, and that was the first time they apologised to me and promised to help me secure a Chinese visa,” Owolabi said. Owolabi said he had been having medical challenges since the incident occurred. “These days, I find it hard to sleep at night. The doctor said I should do a brain CT and spinal cord X- Ray and it costs about N45, 000,” he said. He urged the government to ensure that Nigerians were not maltreated in their respective places of work. Attempts to contact Mike on the telephone proved abortive as he did not answer calls made to his telephone and also did not respond to a text message sent to the phone. Police Public Relations Officer, Muyiwa Adejobi, who confirmed the incident, said the case would soon be transferred to the State Criminal Investigation Department, Eleweran, Abeokuta. This entry was posted in News and tagged Chinese Boss Beats Employee Until He Fainted, Employee Beaten By Chinese Boss In Nigeria.